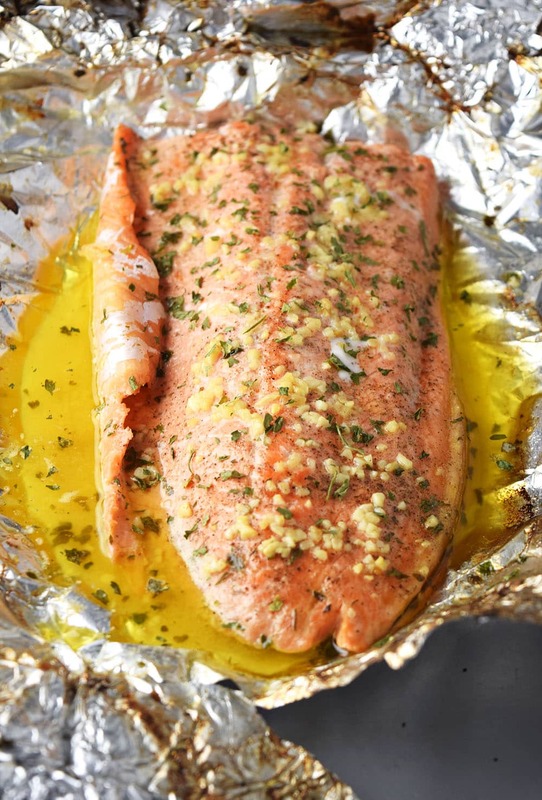 From start to finish, garlic butter steelhead trout (or salmon), cooked in foil is the easiest recipe in the world. I’ve most likely claimed this before on this blog, but I swear this is really the one. Patty and I picked up some steelhead trout at the grocery store for something a little different. 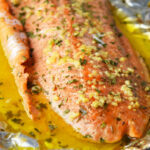 Steelhead trout is very similar to salmon in appearance, however steelhead trout tends to be little stronger in flavor. We weren’t planning anything special for dinner on this random Tuesday night. This recipe was actually a last minute, on the spot, no measure, “wing it” masterpiece. I decided to make this in aluminum foil because I wasn’t really in the mood for cooking or cleaning. 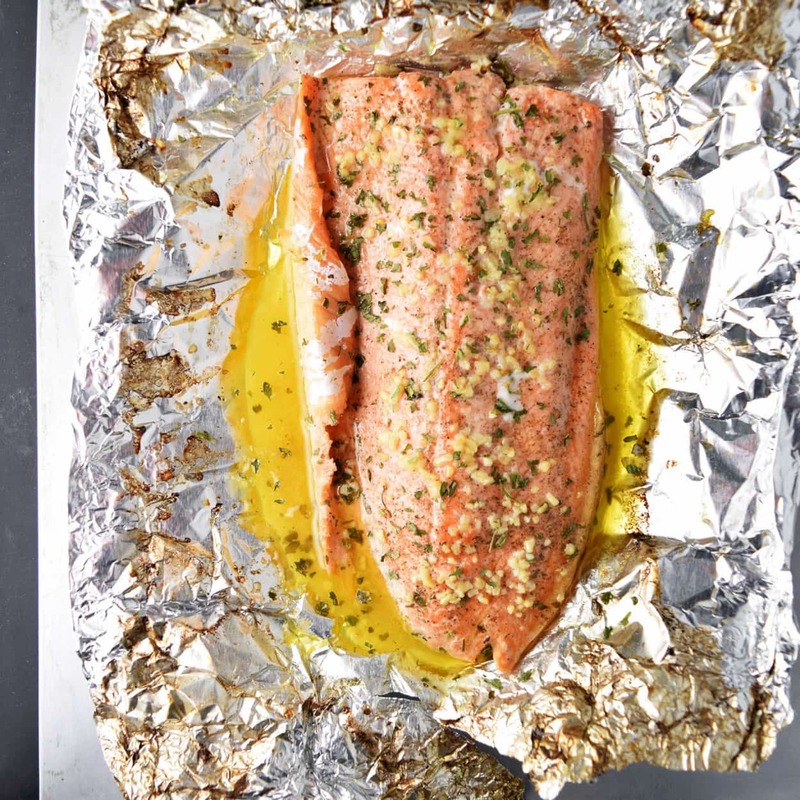 We’ve made salmon in aluminum foil in the past, but never trout. 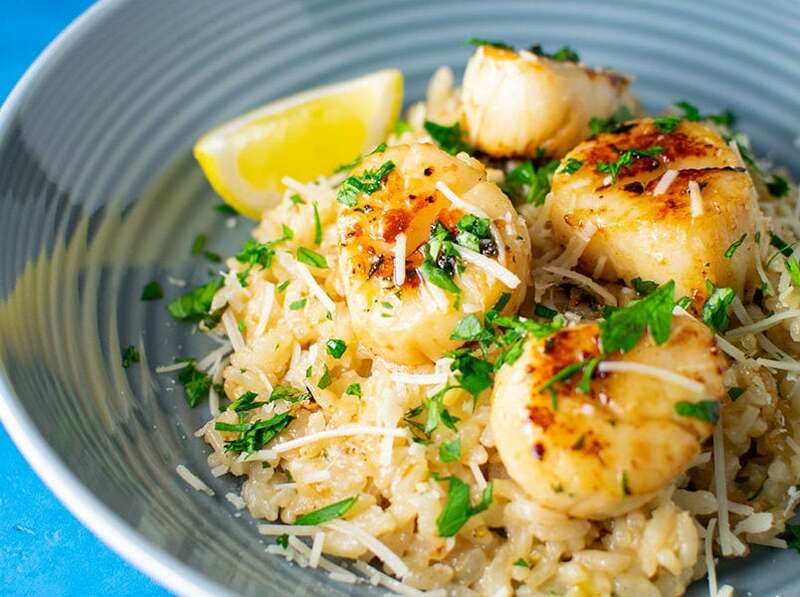 I had lemon, butter, and garlic in the fridge—an easy winning combo. Patty finally chimed in with “OH, you should take a picture of this!” And that’s how we find ourselves here. I think the ingredients speak for themselves. Can ingredients speak? The lemon will give your trout a perfect zesty fresh finish, while the butter and garlic will do exactly what butter and garlic always do. Create awesomeness out of nothing. The cook in foil method is incredibly easy because there is minimal cleanup. I’m talking done in 25 minutes easy. 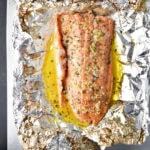 Drizzle trout with lemon, melted butter combined with fresh minced garlic, season with salt and pepper, seal in an aluminum foil packet and bake for 15 minutes. But most of all, my favorite part is the cleanup—roll up the foil, place in trash, grab yourself a beer because you just successfully threw your dishes away for the evening. That’s always a win in my book, gourmet taste without the gourmet effort. Melt butter in microwave safe bowl, stir in fresh minced garlic, and drizzle over the trout until evenly coated. Top with fresh minced parsley. 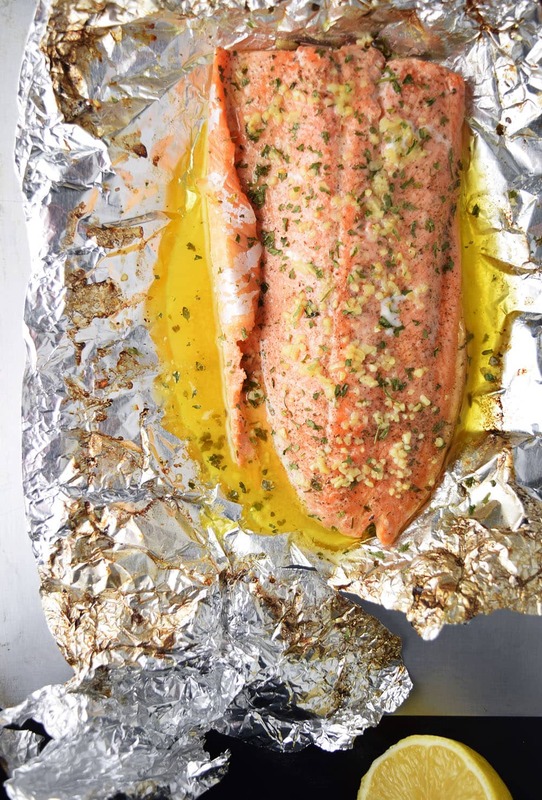 Fold the sides of the foil over the trout, covering completely, and seal into a closed packet. Place directly on oven rack and bake until cooked through, about 15-20 minutes. I’m with you on that one Mike. Love to make everything my own. Glad you liked this one! Thanks for note. Ha! Yes I am – thanks for noticing. I tweaked it a bit. I used Paul Pourdone Seafood Magic for the seasoning and a bit of garlic. Waaaayyyy too simple of a recipe, but, we loved it! The tip of opening up the foil for the last few minutes is the way to go. Thanks for this! Absolutely AMAZING!! This was sooo delicious and easy!! My husband bought steelhead thinking it was salmon and we had never had steelhead so I was so totally afraid I wouldn’t like it and it would be too fishy. (I’m very picky about my fish) But I was so pleasantly surprised with how mellow and delicious it was. I did the broiling at the end too. Awwww soooo good! Thank you for such a great recipe! Awesome Melanie. It’s stronger but delicious if prepared the right way. Glad you liked the recipe! OMG!!! Absolutely delicious. I have never written a review on a recipe ever, but for this one I just had to. Just made it, ate it and wishing I had made more. Got anymore to share? Wow – I am honored. I’d like to say I have a whole blog’s worth where that came from. 107 others to be exact. Check me out. This was a really great recipe! My husband was looking for more, lol. Tried this tonight with a few alterations. No fresh lemon or garlic, so Penzey’s minced garlic and also their Mural of Flavor spice which has lemon peel in it. Otherwise, salt and pepper, in the foiled packet. Served with spiralized butternut squash, cooked in a little oil and finished with salt and pepper. It was a great dinner for my hubby who is must control his carbs. Sounds absolutely fantastic. Butternut squash noodles are sooo good. I have never had fish that tasted so good. This recipe is wonderful! Like someone else said, I too have never written a review before but I felt compelled to with this recipe. Thanks! Wow – thank you very much for the note! Tasted amazing. I subbed fresh baby dill for the parsley but otherwise did everything as directed. 16 minutes at 375 and 4 under the broiler was perfect for my 1.75 lb fillet. I like the addition of baby dill. I’ll have to try that. Also recommend cilantro if you like it. I want to try this tonight, but do you think I could use the barbeque instead? I’m not sure about how long to leave it and will unfortunately miss the broiling part which everyone is raving about. I would wrap in foil and grill with the cover down for 10-15 minutes. Give that a try! Thanks! Turned out perfectly! Simple and elegant! Will definitely be checking out your blog! I made this tonight and I honestly have to say it was amazing! I’ve never had steelhead let alone cooked it! Thank you for such an easy delicious recipe! You’re welcome Rosie – this one is a great easy win. 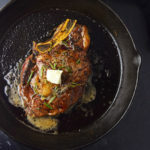 Just tried this recipe – it was fantastic! We had one glitch, though. I bought a 2lb steelhead fillet, so I doubled the ingredients, and because the fillet was so big after wrapping it in foil I put it in a Pyrex baking pan to bake (I was afraid it would leak). It took about 55 minutes at 375, then it was perfect – at 20 mins it was still raw. 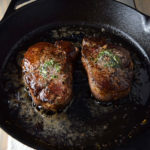 I’m not a very experienced cook so I don’t know if it was the size of the fillet or putting it in the pan that affected the baking time – everything else was great, including the broiling at the end. Thanks! Hi thinking of making the garlic trout. What will I serve it with? Hubby just caught a Steelhead today so had to look online for best way to bake it. So happy I stopped at your recipe, we loved the way it came out. Nothing better than fresh Steelhead, homemade fries and green beans. Yummy!! Just wish I could post the picture I took. ? Like Tyler, I subbed out the parsley, for dill, on my 1.5 lb. fillet. Thanks Brynlds – I need to try this dill craze. Thanks again for sharing your craft! I did everything that you said except I threw 5 pieces of asparagus in each package. It was freaking amazing. I love trout and for 40 years I have been frying it in a pan. No more!!!! Awesome Dana – I need to try adding asparagus! Going to try this tonight. I have to say not a real fish eater but I have my 93 yr old mother living with me and I try to fix her healthy home made food. I’ll let you know how it turns out. I always look at reviews. That’s why I’m making this recipe. You will love it Renita! And bless you, cherish every moment with your Mom. We just buried our 98 year old father today. My husband and I have been wanting to try cooking trout. Googling for Recipes, came upon this one. After reading the reviews, I can’t wait to try it! But… this site won’t let me print the recipe. How come?? Hi Carolyn – I’m in the process of trying to fix that feature. It’s actually an issue with the plugin I use to organize recipes. Cooked this last night. My wife and I loved it. I finished it off open foil under the broil to brown the top a bit. Otherwise according to recipe. The combination of butter, garlic, and lemon made it shine. Thanks Shawn. The four of us loved it. Yes even the two picky teenagers! Will definitely be making this again I followed the recipe to detail and it did not disappoint! Thank you! It’s a no fail recipe! Going to try your recipe today. 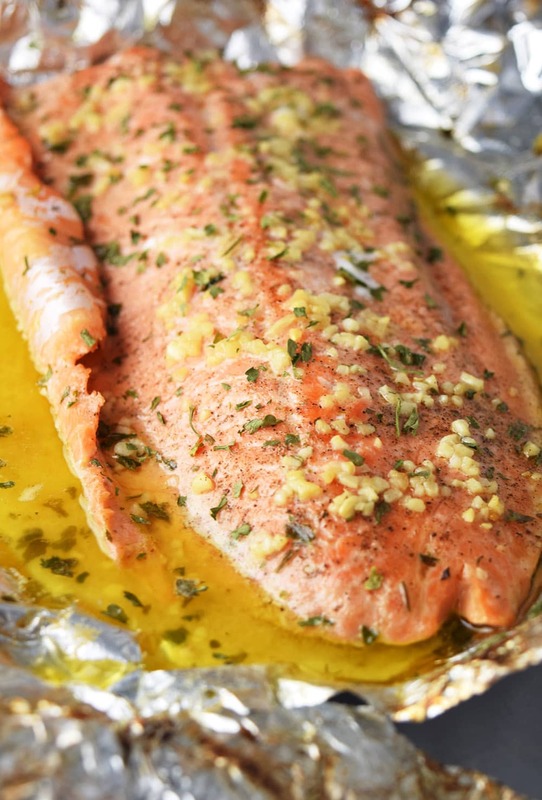 I’ve always drizzled honey over my pan fried salmon, so using honey drizzle on the trout. I like the browned top, so will put under broiler. Yes I agree – caramelized honey on salmon is out of this world. This is definitely a no fail receipt…..best brown trout I have ever had. I followed the recipe with no deviations……For sure a keeper recipe! This was fantastic!! I bought a 2 lb. steelhead trout and my little family of 4 (9 and 7 year olds included) ate the ENTIRE thing. I didn’t think we’d finish off a 2 lb. filet but we did. 🙂 And yes, the broiling tip at the end is a must! Thanks for sharing this recipe. Thanks Kaylan – glad everyone liked it! The broiling is easily my favorite part. Hubby landed several steelhead a couples weekends ago so we cleaned them and froze. 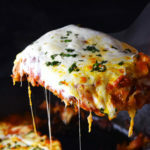 We love your recipe and substitute dry ingredients……simple and so delicious! Have made this twice now. A recipe simple enough that even I can handle it. My favorite kind of recipe: unbelievably good and simple. I made with whole trout. This will become a regular offering in my house. What makes this better is cooking it on a grill with mequite chips smoking and instead of foil put it on a mesquite board! I am very hesitant about cooking fish. Tried this recipe and it was DELICIOUS! 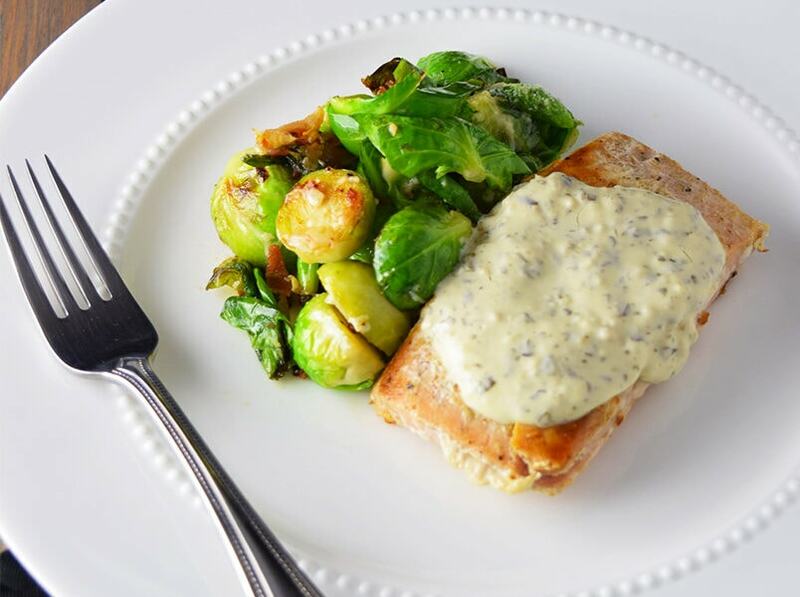 Making this tonight upon request with trying steelhead for the first time! Definitely looking forward to it, as well as checking out your other simple and yummy recipes! This is amazing! Quick and easy instruction which I followed to a T with the exception of broiling. 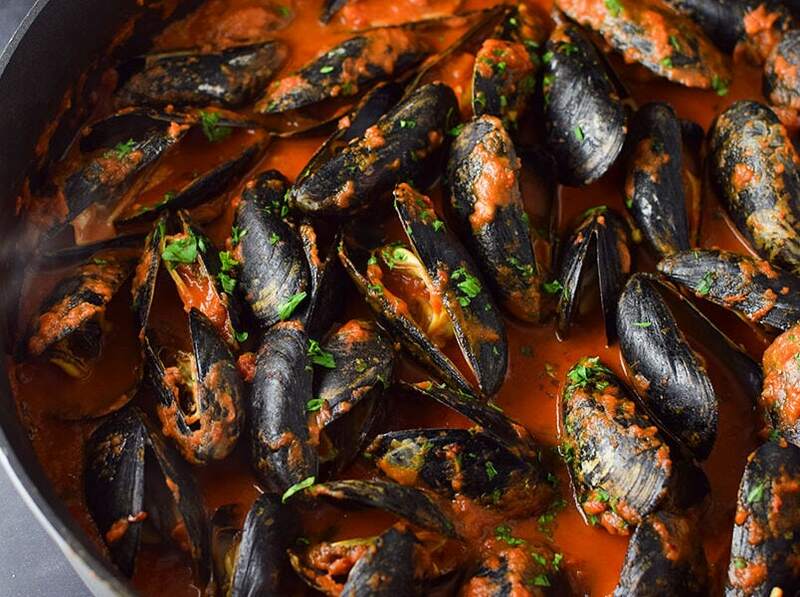 My family and quests thoroughly enjoyed it and I will be definitely be making this again. love this recipe I made this trout with fettuccine alfredo and it was amazing. Simplest, tastiest, easiest, healthy recipe I’ve come across in a long while. Definitely recommend broiling the trout at the end for a little added crispiness. I really enjoyed this recipe. It was simple and easy to follow and execute. It tasted delicious! The only issue I had was when it was time for the last 5-ish minutes for broiling–what temperature should it be at? Thanks!! Will be trying out more of your recipes due to how delicious this one was! Fantastic! Love one “pot” meals and that’s exactly what I turned this recipe into. 1st time I put a thin layer of onion on the foil, covered that with fresh spinach, & thinly sliced potatoes. Seasoned each layer lightly with salt, pepper and dill then followed the rest of the recipe Husband couldn’t rave about it enough. 2nd time layer of onions, zucchini and precooked rice, seasoning the same and again followed the recipe. This is definitely a favorite recipe. This was amazing! I made it last night for the family and they ate it right up! Your recipes are so easy to follow. They are so delicious . Just can’t wait to get into the Kitchen again. Thanks my brother..
Love this recipe my family loves it!! Thank you letting us enjoy your recipe!! I omitted the garlic and used Durkee’s citrus grill seasoning. Serve over sautéed spinach for a perfect fish entree. 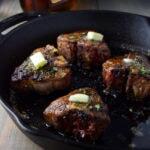 Friends and family request this simple recipe when invited for dinner. Awesome! I’m a college student so salmon is usually out of my budget but it was on sale at the store today so I was able to get 2lbs which will last me at least 4 meals. Because it’s such a rare treat for me, I wanted to make sure that it came out perfect, and was this recipe perfect. I used the bottled lemon juice and no parsley but otherwise stuck to the recipe (though I did double the butter and garlic since my fish was bigger). 17 minutes in the oven and I got the most succulent, perfectly cooked salmon I have ever had. The only thing I think could have been better would be to add more lemon juice, but it’s easy enough to just splash some more on before eating. Yes indeed, what an Awesome recipe. Thanks for sharing I had all the ingredients because we’re on the health kick and I’m always looking for recipe for salmon, chicken and fish. Since my stroke earlier this year, I am on a strict Pescatarian diet. Getting a little tired of salmon I came across your Trout recipe. I followed this to the T, although I did spend 5 minutes pin-boning. What an excellent result, so pleased I tried it. Such a different taste to salmon. Had it with a small salad with beetroot, cherry tomatoes and sprinkled with a few seeds. I am going to try it tonight. Can’t wait Just know that it will come through with a bang. Thanks a lot for sharing. I don’t eat fish, but I cook it every once in a while for my hubby. What sides do you recommend to go with this dish? I was thinking lemon pepper rice and asparagus. Throw some ideas my way please!!! Thank you!!! Yummmoooo. That was amazing with some cooked quinoa. Can’t wait to make it again. First time we tried steelhead trout. This was so good!! My girlfriend doesn’t care for lemon and she really liked this.